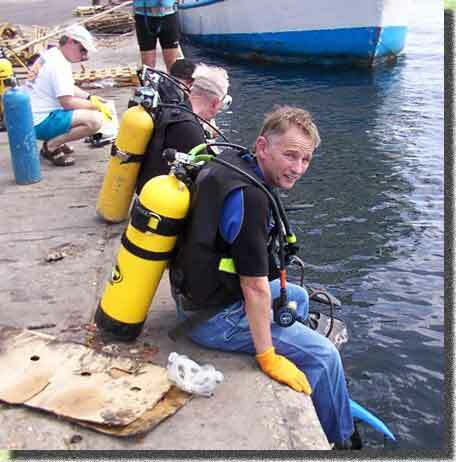 From 1998 to 2001, MAHS assisted in underwater archaeological investigations on the island of Curaçao. Curaçao lies in the southern Caribbean, about 50 miles from the coastline of Venezuela, on the edge of the South American continent. The archaeological work focused on the wrecks of two vessels that lie near the entrance to the island's main harbor, Willemstad: the Mediator, an English steamship that sank in 1884 after colliding with another vessel; and the Alphen, a Dutch warship that sank in 1778 after its main powder magazine exploded. MAHS volunteers worked under the direction of Dr. Wil Nagelkerken, Marine Archaeologist for the Stichting Mariene Archeologie Nederlandse Antillen [STIMANA]. 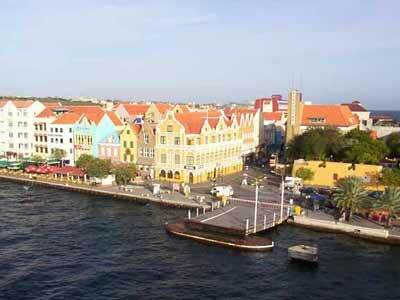 The work was conducted along the picturesque Willemstad waterfront, seen on the left.